F-22 Raptor wallpapers for your PC, Android Device, Iphone or Tablet PC. If you want to download F-22 Raptor High Quality wallpapers for your desktop, please download this wallpapers above and click «set as desktop background». You can share this wallpaper in social networks, we will be very grateful to you. The race for the fifth generation continues in the world. 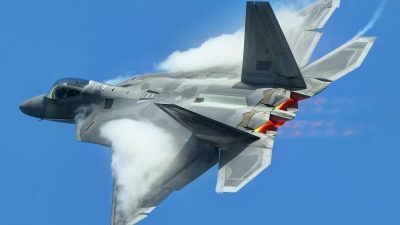 Russia is carrying out modifications of the T-50, China is in a hurry to launch its J-20 into mass production, the Japanese are preparing for the first flight of the Mitsubishi ATD-X. And only one country in the world can not participate in these competitions, because it has already won in them. The first pre-production F-22 Raptor took off on September 7, 1997, showing the whole world that the United States is the world leader in the field of military aircraft. In 2001, the mass production of this machine began. 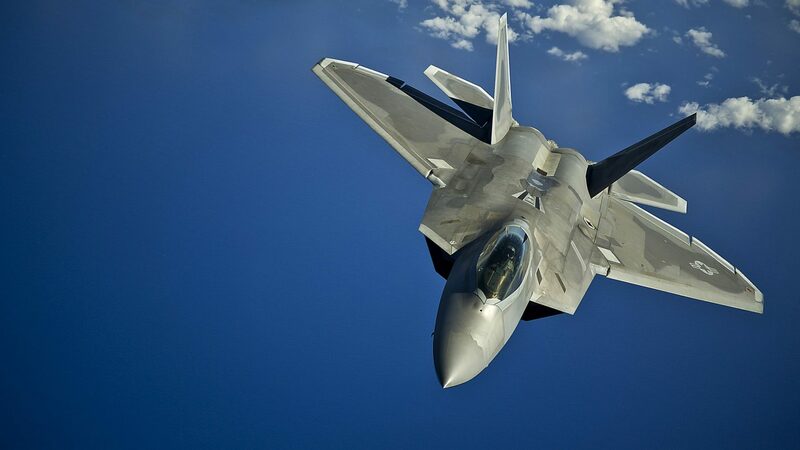 F-22 Raptor is a real aircraft of the XXI century, it embodies the latest technological advances. 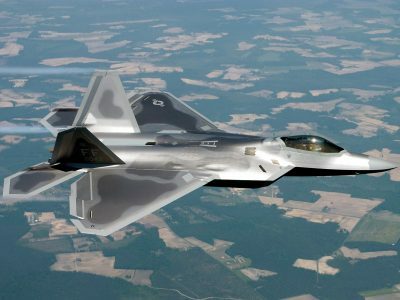 Today, American companies are already working on the creation of the sixth generation fighter, which will be equipped with combat lasers and controlled by artificial intelligence. The temporary handicap that Americans have allows them to carry out these works without haste. Before talking about fifth-generation aircraft, I need to say a few words about the requirements that these machines impose. What features and characteristics give the basis to rank the concrete car to this generation. The first generation of fighter aircraft include cars made in the 40-50s of the last century. They had a straight wing and subsonic flight speed. These machines include Messerschmitt Me.262, F-80 “Shooting Star”, MiG-9. In the second generation of fighters entered the aircraft, released in the 50-60 years. These machines had near-sonic speed, an arrow-shaped wing, an engine with an afterburner, and a radar was installed on the plane. The following vehicles belong to this generation: MiG-15, MiG-17, MiG-19 and F-86 Saber. 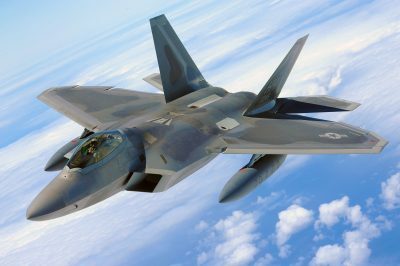 The third generation of fighters was produced between the 60s and 80s of the last century. These machines could develop supersonic speeds (up to 2 Machs), had a more advanced jet engine, and were armed with air-to-air missiles. This group includes the MiG-21, MiG-23, F-4 “Phantom”. 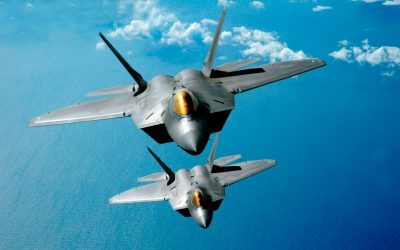 The fourth generation of fighter aircraft appeared in the early 80s of the last century, most of the aircraft that are in service with different countries of the world belong to this generation. They still continue to produce and develop. This generation includes: MiG-29, Su-27, F-15, F-16 and many others. 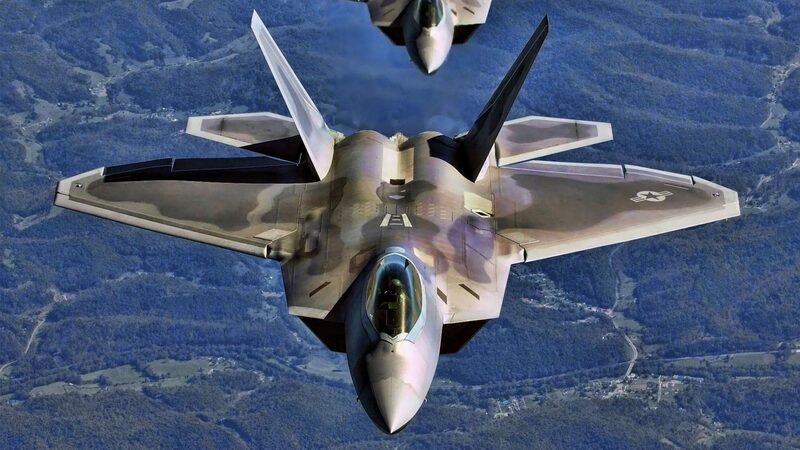 The main differences of these aircraft from the previous generation are: the presence of more advanced avionics, dual-circuit aircraft engine, guided weapons. At the end of the 70s of the last century, when fourth-generation fighters were just “standing on the wing,” preparatory work began on creating a fifth-generation fighter in the United States and the USSR, which led to the creation of the F-22 Raptor. more advanced on-board radio-electronic equipment, which includes a radar with an active phased array. 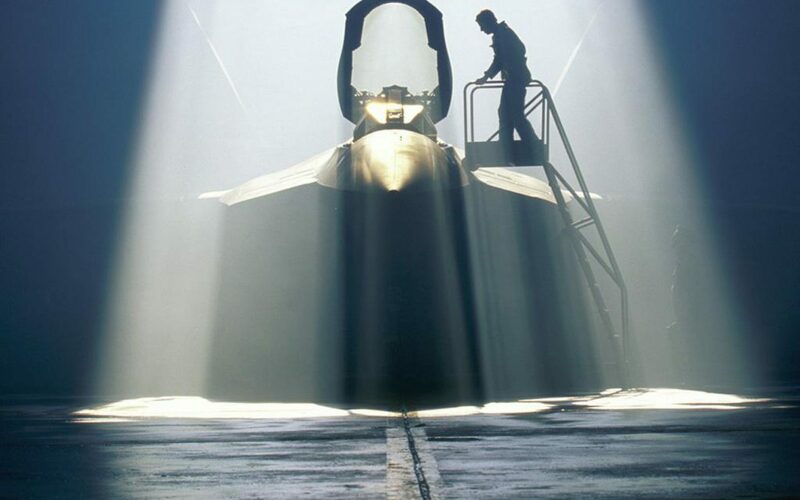 In 1981, the US military prepared a technical task for the development of a new fighter. 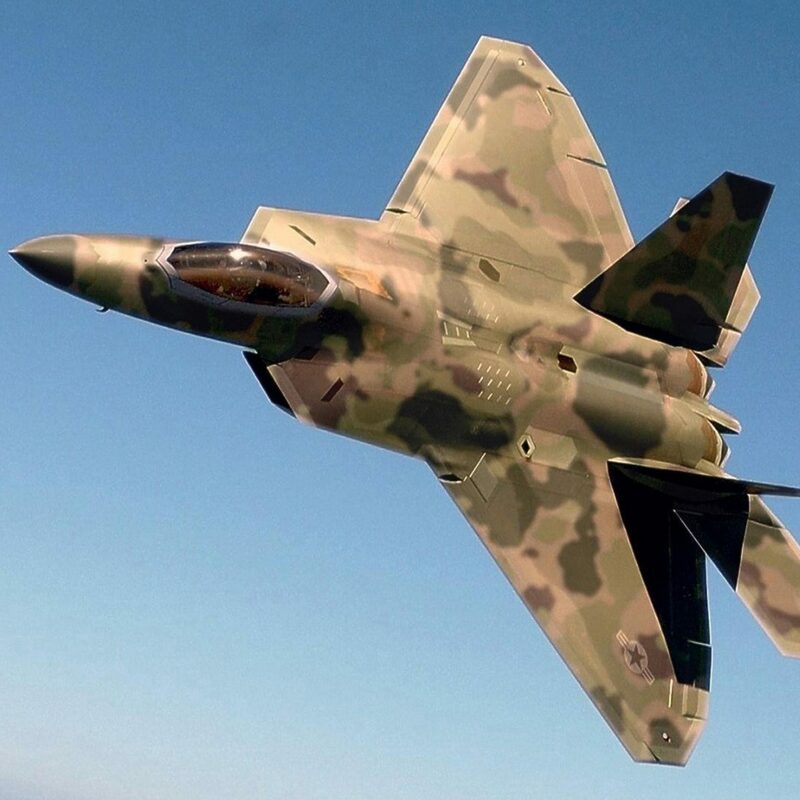 Work on the new machine had to be carried out taking into account the latest technological advances of the time: the military demanded to equip the fighter with perfect avionics, make it unobtrusive to enemy radar, install fundamentally new engines on it. The main objective of the new aircraft was to gain air supremacy. In 1986, the competition began, in which the largest American companies took part. Two groups of companies came to its final part: Northrop / McDonnell Douglas and Lockheed / Boeing / General Dynamics. It was they who in 1990 presented two prototype aircraft. The following year, the Lockheed / Boeing / General Dynamics group was declared the winner of the competition; it was to build a fifth-generation American fighter. 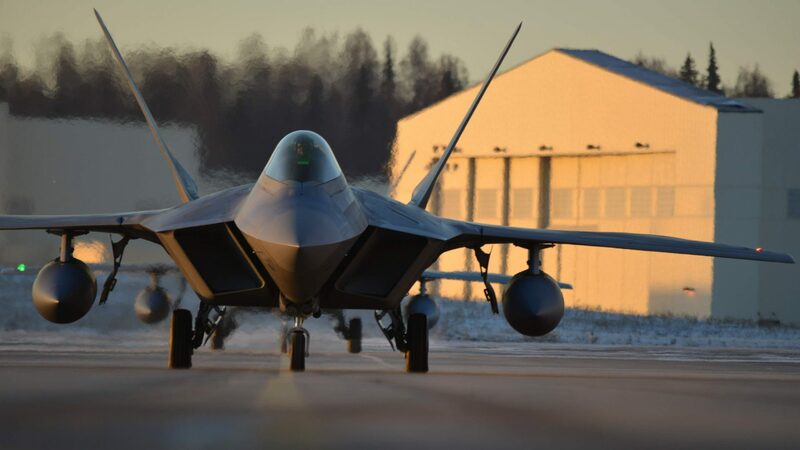 It took six years to build a pre-production car, the first F-22 Raptor aircraft took off in 1997, mass production started in 2001, and since 2005 this aircraft began to be officially operated. The first squadron, fully equipped with these machines, appeared in 2006. It should be noted that the number of vehicles that the US military department planned to purchase from the manufacturer was constantly decreasing. In 2006, the military wanted to buy 384 cars, but after two years their number had more than doubled, to 188 aircraft. 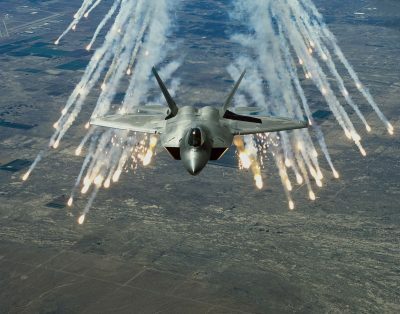 The main reason was the high cost of the fighter, as well as the outbreak of the global crisis, which made the American military somewhat temper appetites. 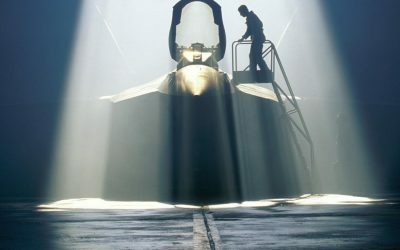 In 2009, the US Secretary of Defense announced plans to cut off aircraft production. 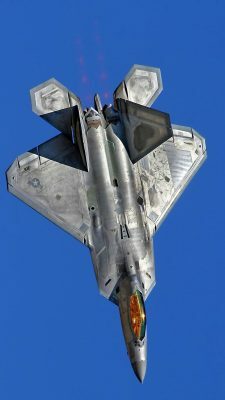 In 2011, the last F-22 Raptor rolled off the assembly line. 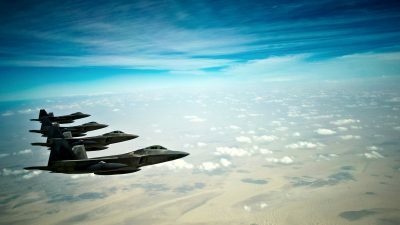 In the same year, the US Congress decided to activate the program of another fifth-generation fighter – the F-35 Lightning, which had a lower cost. 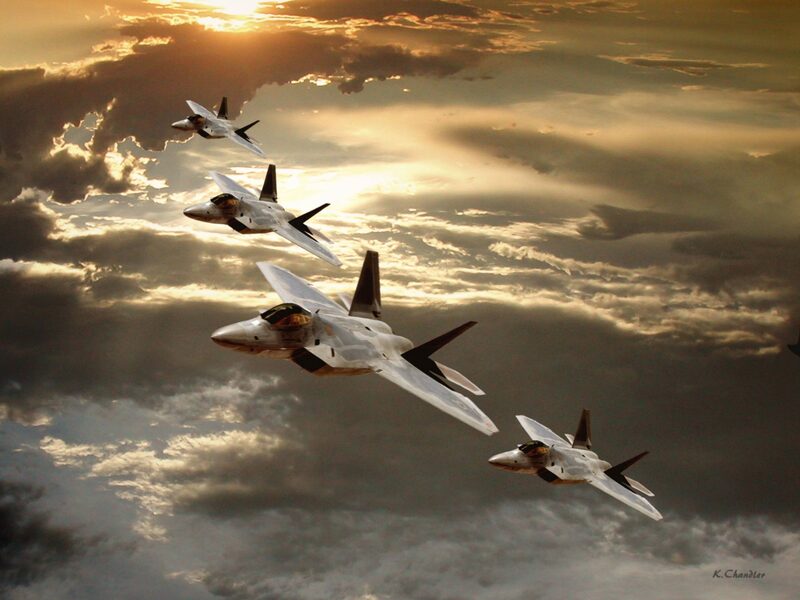 To date, the F-22 is the only fifth-generation fighter, which has been tested and adopted for service. In addition, this aircraft is the most expensive fighter in the history of aviation. The cost of one machine, without taking into account the funds spent on its development, is $ 146 million. Quite expensive and maintenance of this aircraft. The main problem is the vulnerability of the radar absorbing coating, which requires special care. The F-22 Raptor was not used in real combat conditions against enemy combat aircraft. The only case of its use took place in 2014, when a rocket attack was launched on Islamic terrorists in Syria. But this case can hardly be called a full-fledged use of a fighter. The aircraft is made according to the integrated circuit; it has a highly trapezoidal wing. Sweep the front edge of the wing – 42 degrees. Titan alloys, aluminum alloys, composite and radio absorbing materials are widely used in the construction of the airframe. Composite materials not only allowed to reduce the level of radar visibility of the aircraft, but also significantly reduced its mass. Vertical plumage – two-fin. Keels are wide apart and sloped outward (28 degrees). The horizontal plumage is all-turning. All the joints formed at the junction of various parts and parts of the aircraft have a sawtooth shape, which reduces the reflection of electromagnetic waves. Much attention is paid to the survivability of the machine, taking into account the survivability of the aircraft after hitting high-explosive ordnance, similar to those in service with the Russian Air Force. The cockpit has a tail-free lantern made of polycarbonate. It has a special coating that scatters radio waves. According to pilot reviews, the F-22 Raptor cockpit is one of the most comfortable among all American fighters. The lantern provides the pilot with an excellent overview. The ejection seat of the ACES II allows the pilot to be evacuated at all speeds and altitudes. 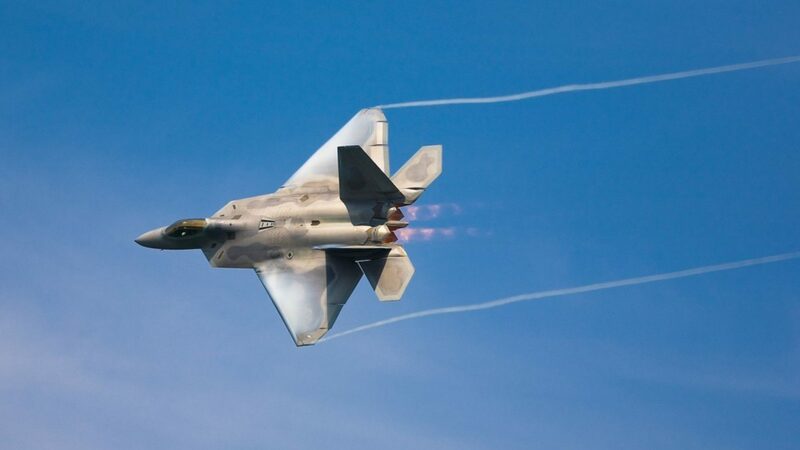 The F-22 Raptor powerplant consists of two Pratt & Whitney F119-PW-100 two-circuit turbojet engines, they allow the aircraft to develop supersonic speed without the use of afterburner, which is one of the basic requirements for fifth-generation aircraft. 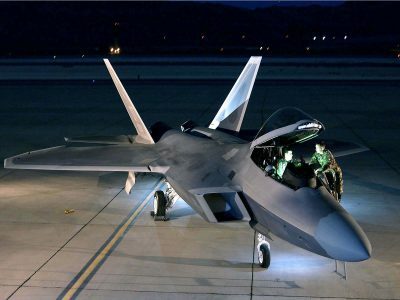 In addition, these engines are equipped with a thrust vectoring control, which significantly increases the maneuverability of the fighter. The nozzles have fixed side walls and deviating lower and upper edges, which allow the machine to change the deviations of the thrust vector and adjust the nozzle cross section. In addition, flat nozzles reduce the visibility of the aircraft in the infrared range. Air intakes are unregulated, diamond-shaped, have an S-shaped channel for shielding the engine compressors from the radiation. The aircraft is equipped with the onboard avionics system developed by TRW, it includes the ICNIA data processing system, communication system, navigation and identification system, and an electronic combat system, including: An Electronic Sanders / General Electric system AN / ALR-944 77. About the radar installed on the fighter, it is worth mentioning separately. This is an antenna with an active phased array, which consists of 2 thousand elements, radiating and receiving a signal. This radar can detect targets with EPR 1 m² at a distance of 225 km in normal mode and 193 km in LPI mode, cruise missiles with an EPR of 0.1 m² – at a distance of 125 km. The low interception probability (LPI) mode allows the F-22 Raptor to detect targets, but still go unnoticed. 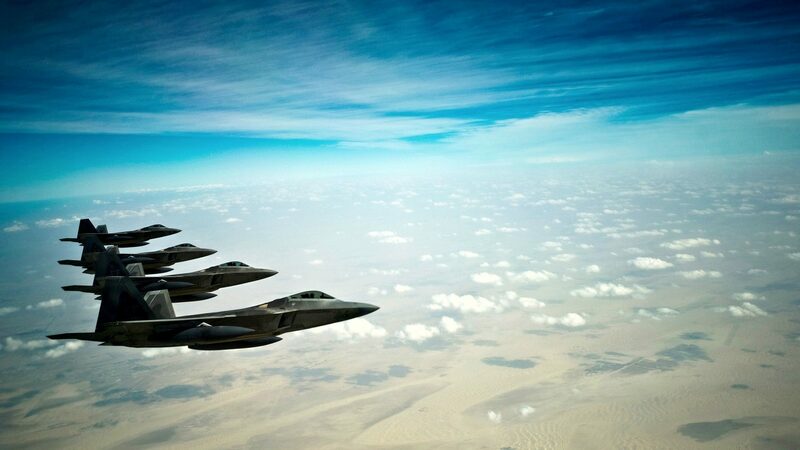 The Raptor is armed with a 20mm M61A2 Vulcan cannon and air-to-air missiles AIM-120C AMRAAM and AIM-9M Sidewinder. The concept of the use of the aircraft can be described by the following motto: “I found it earlier – I destroyed it faster”. 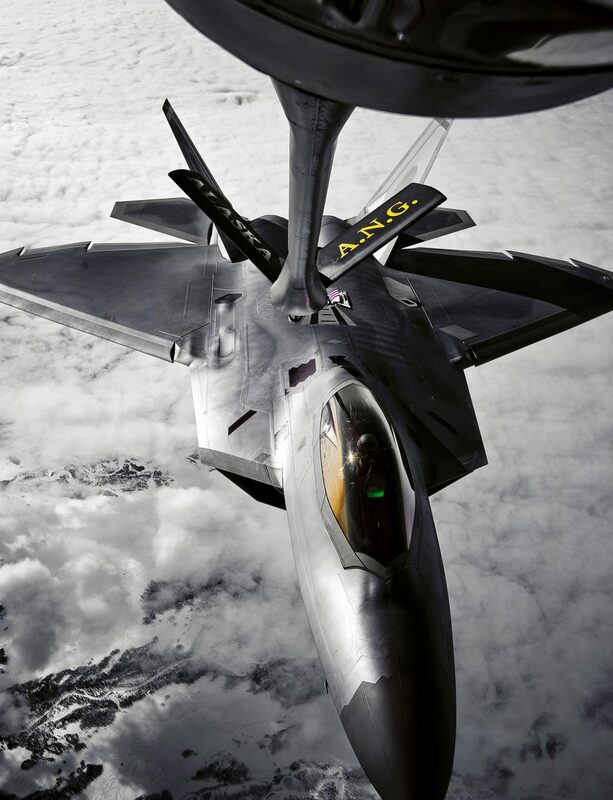 An excellent range of electronic equipment, especially powerful and sophisticated radar, gives the fighter the ability to detect the enemy at long distances, and go unnoticed. 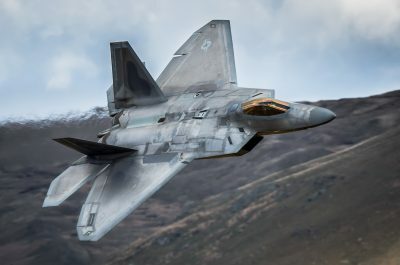 The fighter’s low radar visibility makes it possible for the F-22 Raptor to be the first to detect an enemy aircraft and destroy it. In addition, modern fourth-generation aircraft before launching the rocket include the afterburner to gain speed, the Raptor does not need to do this. The F-22 Raptor has a significant practical ceiling, which is also an advantage in aerial combat. 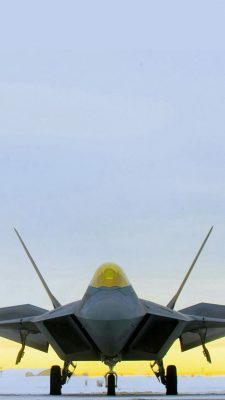 According to its maneuvering characteristics, the F-22 surpasses any fourth-generation aircraft. 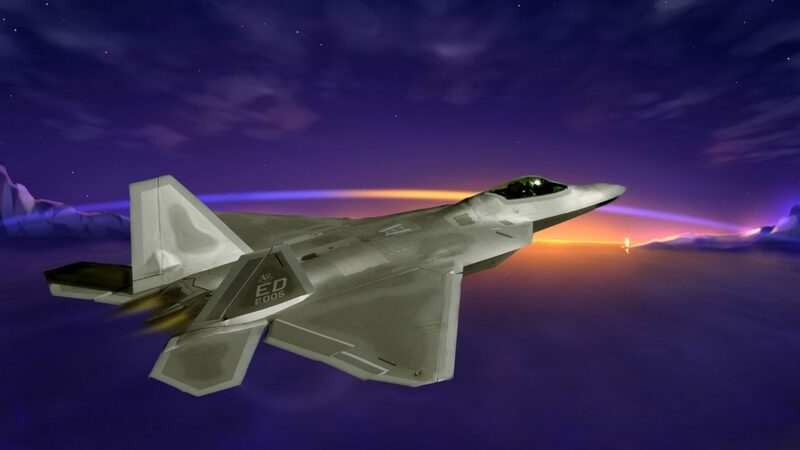 Excellent aerodynamic qualities of the aircraft, thrust vectoring engines provide the fighter with excellent maneuverability and controllability in any flight modes. Multifunctional. 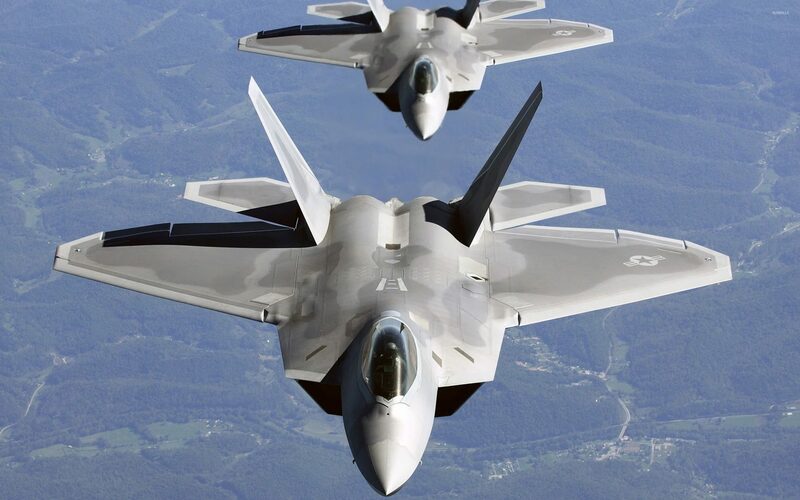 F-22 Raptor was originally designed as a fighter, which should win air superiority. Therefore, it is not well adapted for striking ground targets. Most of the standard American air-to-ground weapons simply do not fit in its internal compartments. You can mount a weapon on the outer suspension, but in this case the fighter loses its main advantage: stealth. The main problem that arose during the operation of this aircraft was a problem with the oxygen supply system for the pilot’s breathing. Pilots complained of choking and unusual odors in the cockpit. In 2012, for this reason, severe restrictions on flights were introduced: pilots could not move away from the runways for a considerable distance, and also to rise above 7.6 thousand meters. An audit was conducted, which resulted in the discovery of the cause of the problem. She turned out to be a vest, which pilots wear to make breathing easier. Changes were made to its design, and the problem was solved.